Railpictures.ca - Mike Molnar Photo: The afternoon local makes its way north on the Chrysler Spur to serve a couple of industries about a 1/4 mile behind the camera. 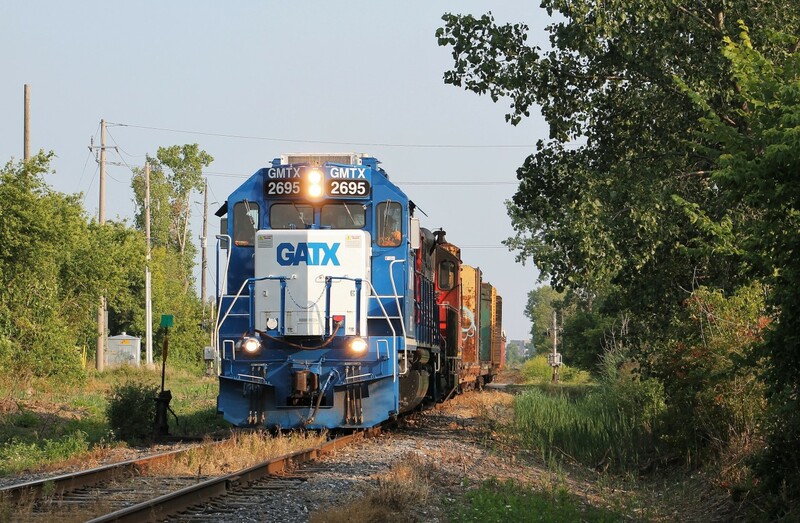 CN has been leasing a lot of road power over the last several months but is now starting to lease some blue GATX GP38s for yard and local work. Will these be the replacements for the remaining GP9rm and EMD-1 units left on CN? I guess only time will tell. | Railpictures.ca – Canadian Railway Photography – photographie ferroviaire Canadienne. Caption: The afternoon local makes its way north on the Chrysler Spur to serve a couple of industries about a 1/4 mile behind the camera. CN has been leasing a lot of road power over the last several months but is now starting to lease some blue GATX GP38s for yard and local work. Will these be the replacements for the remaining GP9rm and EMD-1 units left on CN? I guess only time will tell. Yeah I guess I never looked at the bigger picture. A lot of the ECO rebuilds EMD has put out are not very reliable and most seem to completely conk out fairly quickly. I’m surprised CP’s GP20s and SD30s have lasted so long compared to other ECO projects EMD did in the mid 2000s and early 2010s. I hope CN keeps their vintage power. But they could always buy out leased power like these and rebuild their yard power fleet with them. I guess we will have to wait and see. Also thanks BradKetchen for the compliment! @Mike…well we do know that CN and CP think very differently when it comes to motive power. If CN were to retire older power, what would they replace them with? They have not retired any of the GP38-2′s and other than a handful of GP9′s and slugs the fleet is relatively in tact. Notice no other class 1′s followed CP with any GP9 or SD40 rebuilds? NS does in house stuff for themselves and others but the CP rebuild experiment was not repeated by any other railroads. The fact that the 2 builders no longer offer lower hp locomotives leaves little choice other than to keep running those old units until the die. If CN really was short of lower HP power they could easily purchase old hand me downs like the did with the SD60′s and Dash 8′s. I was just reading trains mag Mar 2017 article: ‘CN’s lessons’… this is one of the reasons why CN is leading the big 5 way ahead of CP..more traffic and hanging on to their GP9m’s and of course leasing… what happened with those ugly CP units? What were they again? Money not well spent… my 2 cents. I love these GATX units btw. Great shot! I only say that because that’s what happened at CP. I could see CN retiring old yard power over the next few years. Replacements? Highly unlikely. CN is power short for sure, but remember other than a nicer looking paint job, these leasers have the same prime mover and CN’s GP38-2/W’s and GP9′s. I am sure some of the leasers have been given overhauls but CN could do the same with their fleet too. So far that has not happened like it did at CP.